So what had gone so wrong to trigger quite such remorse? After all, it’s difficult for a company like Spotify to poison people or leave them stranded at an airport, which is the sort of thing other businesses end up grovelling about. A hoo-ha about something like terms and conditions is quite a recent phenomenon. Most of the businesses we work with used to see Ts&Cs as something almost invisible: legal i-dotting and t-crossing most customers would happily ignore. Well, not any more. First, people are demanding more and more transparency from the businesses they deal with, even the ones they feel pretty warmly towards. Second, customers have woken up to the fact that things like Ts&Cs aren’t small beer: they tell you something about the business you’re dealing with. And third, platforms like Twitter give customers a forum to make a PR mountain out of issues brands would rather were molehills. And it’s not just the length that’s a problem. Getting through it all depends on me being smart. You can measure the readability of text, using tools like the Flesch-Kincaid index. 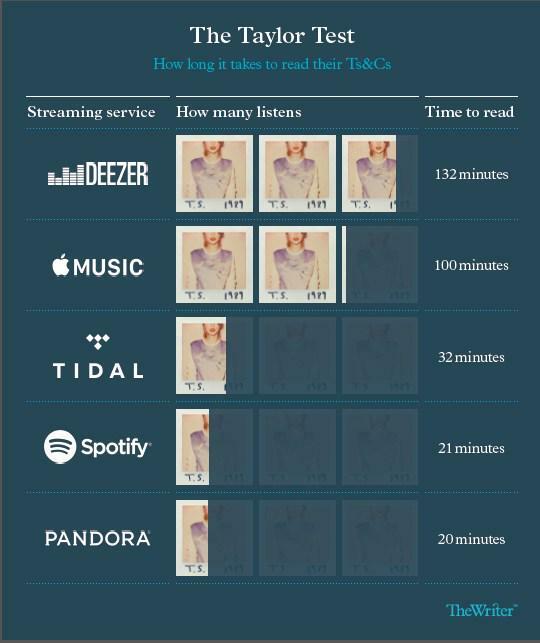 The Apple Music terms score in the low thirties – about the level of the Harvard Law Review (not that surprising, if the terms have been drafted by a room full of lawyers). Realistically, that means they’re too long and dense for almost everyone to read. Which means we don’t know what we’re signing up to. We’re bored or intimidated into clicking ‘Accept’, which, in turn, means the businesses end up with all the power. And that’s not fair. Is that how you want your customers to feel when they first meet you? If someone tried those tactics with you face to face, or even on the phone, you’d probably just walk away. All of this means there’s a big opportunity for canny brands. Something that’s currently seen as a bit of legal back-covering could send quite a different signal. Could you make this first touchpoint something to be proud of? Something that actually sets the tone for how you’d like the rest of the relationship with your customers to be? By the way, it isn’t just us writers, or Spotify’s customers, who think this is a big deal. Even the Financial Conduct Authority has said that financial services brands have a duty to help customers understand their small print. And that a more creative, considerate approach could actually give those brave businesses a competitive advantage. So here’s what we suggest: a new standard for Ts&Cs. We did some research a while ago that suggested the average reader will spend no more than five minutes reading them (and we suspect that’s gone down as terms have migrated from paper to web browsers, smartphone screens and Boris bike terminals). And here’s what the standard should be: a responsible business should be able to boil its terms down to something that an intelligent teenager can read in five minutes (that means 1,000 words and a score of 60 to 70 on the Flesch-Kincaid test). It might mean cutting some stuff. But hey, do your customers really need telling that they’re not allowed to use your music service to make weapons? One of my favourite clients is a bolshy marketer who loves bringing her legal friends down to earth with a bump: ‘Yes, I know there’s a theoretical risk. But have we ever got it wrong, and has anyone ever sued us? And if they did, would it still outweigh the benefit of making this damn thing clear for the rest of our customers?’ It’s a good challenge, and one that non-lawyers should make more often. All of which means that businesses need to make a process change, too. At the moment it’s usually the legal team that have the final say. Well, if they can’t hit the standard, we say give the job to someone else: marketing or customer experience, with the legal team as expert advisers. Because it’s a job that’s now important enough to be in the hands of someone who knows how easy it is to win or lose a reputation, and a customer. Neil Taylor is creative partner at The Writer, and author of Brilliant Business Writing.